“DO NOT DISTURB” – If you find active “live” termites, leave them alone. 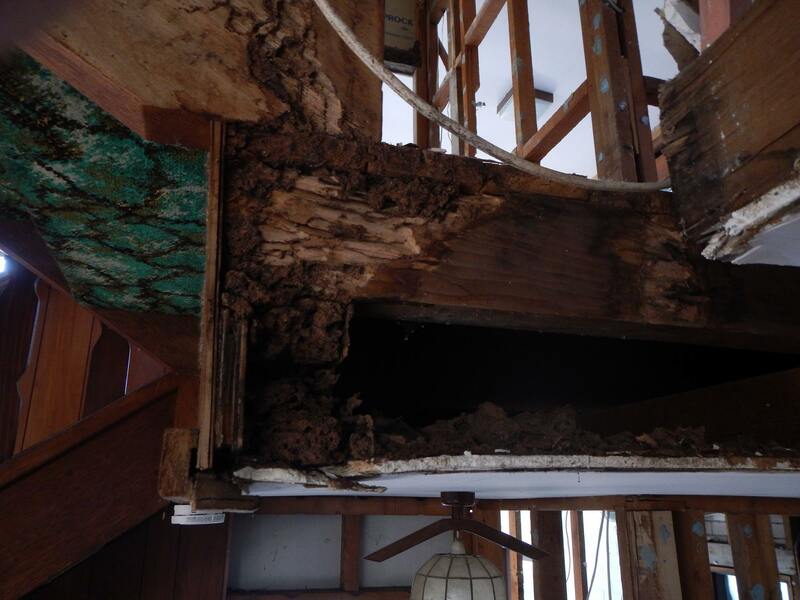 Don’t let them know you are on to them – Contact Southpest immediately…..
How Termites Attack Your Home; The most destructive species live in large underground nests containing several million timber destroying insects. The problem arises when a nest matures near your home. Your home provides natural shelter and a food source for the termites. They’ll travel up to 100 metres to enter your home where there is a smorgasbord of timber to feast upon. Even concrete slabs do not act as a barrier, they can penetrate through cracks in the slab or more likely the slab edge which has been concealed to gain access to your home. They even build mud tubes to gain access to above ground timbers. In rare cases termites may create their nest in the cavity wall of the property without making ground contact. In these cases it may be impossible to determine their presence until extensive timber damage occurs. Termite Damage; Once in contact with the timber they can cause extensive damage and then excavate it often leaving only a thin veneer on the outside. If left undiscovered the economic species can cause many thousands of dollars damage and may cost thousands of dollars to treat. Signs of mud accumulation on door and window joins and similar places. Chewing and/or tapping noises behind plaster walls. Blistered paint in places like window and door architraves. Small holes appearing in gyprock walls. any timber in your home that feels soft or spongy. By knowing about these signs, you can put an end to termite infestations more quickly. Exposing slab edges of slab on ground homesHomes constructed on concrete slabs pose special problems with respect to termite attack. If the edge of the slab is concealed by garden beds, lawns or foliage then it is possible for termites to effect concealed entry into the property. They can then cause extensive damage to concealed framing timbers and even the most experienced inspector may be unable to detect their presence due to concealment by wall linings. Only when the termites attack timbers in the roof void, which may in turn be concealed by insulation, can their presence be detected. Where termite damage is located in the roof void it would be expected that extensive damage to concealed framing timbers may be present. With a concrete slab home it is imperative that you expose the edge of the slab and ensure that foliage and garden beds do not cover the slab edge. Weep holes must be kept free of obstructions. Do not store cellulose-based materialslike cardboard boxes, wood piles and wooden objects beneath the home or in direct contact with the soil. Doing so can create a perfect entry point into the home for termites, and they can use these areas for breeding and instigating new colonies. Don’t use untreated timbers for retaining walls or to form garden beds.They can encourage the attack of termites and create a major infestation in your home. Gardens should not be abutting the dwellingThis encourages moisture build up. Re-direct hot water and airconditioning over flow waste away from the houseThese areas encourage termite activity to the structure. Clearance of all weep holes and service entry points needs attention.When covered this encourages termite activity and gives direct access to the main structure and can increase the difficulty of detecting entry points. Check for and or repair leaking shower fittings/sealants.Moisture in internal timbers encourages termite activity.